First step is getting the filling ready. Not a big deal though, start with apples, cored, peeled and sliced into as small pieces as you can, place them into a large pan/pot along with pineapple, sugar, water and salt and cook over medium to high heat for 30 to 35 minutes. 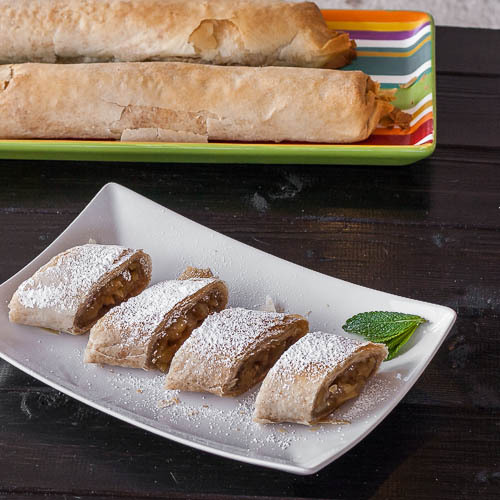 When you are ready to assemble your strudels start laying the phyllo one sheet at a time and gently brush each one with butter and sprinkle with some breadcrumb mixture over the entire surface. Repeat this procedure with 5 sheets. When you have those 5 sheets stacked, “swimming” in butter and breadcrumb mixture, add a row of apple filling the way you see it in my picture. Do not over-stuff or the strudel will burst when baking. Bake for 40 to 45 minutes and you are done. You can use a wax paper underneath the phyllo to help a bit with rolling which I forgot, so roll it up jellyroll style and as you roll fold the sides inward to form sealed edges. It was somewhat difficult but I managed to get some nice strudels going at which point you place them on a buttered baking pan and brush them with butter again. It was a success! You can even freeze the baked ones (tested!) but they need some time in the oven to heat up and get crisp again. As you peel and dice the apples, sprinkle with lemon juice and mix frequently to prevent browning, or toss in iced water with some lemon juice. Place the apples into a large pot on the stove over medium-high heat. Add the pineapple, sugar, 1 cup water and salt. Cook until the moisture evaporates and consistency of the remaining fruit is thicker than preserves, 30 to 35 minutes. Stir often to prevent burning on the bottom. Cool, then stir in walnuts. Refrigerate the apple filling at least overnight. Filling will last in the refrigerator for up to a week in an airtight container. Preheat the oven to 350° F / 175° C.
On a sheet of waxed paper, lay out the first layer of phyllo dough. (Dough dries out quickly, so keep other layers not in use covered with a damp cloth over a sheet of waxed paper.) Using a pastry brush, gently brush butter onto the entire sheet of dough. Sprinkle with the breadcrumb mixture over the entire surface. Repeat for an additional 4 layers so each roll has a total of 5 layers of phyllo dough. Using a spoon, add a row of apple filling an inch or two from the bottom of the dough. Do not over-stuff or the strudel will burst when baking. Lift the bottom edge of the waxed paper with both hands, each about a third of the way in from the outer edges to support the phyllo as you roll up the dough, jellyroll style. As you roll, fold the sides inwards to form sealed edges as you continue to the end. End with the seam-side down. Coat a baking pan with butter and place the first rolled dough onto the pan with the seam facing down. Then brush the roll all over with the butter/oil mixture. Repeat the steps above until you have filled the cookie pan with the rolls but keep at least a roll's width between each. Keep at least 2 to 3 inches between the rolls on the baking sheet to ensure even browning. Bake until golden brown, 40 to 45 minutes, depending on your oven. During baking, baste 4 to 5 times with butter. Cut into pieces while still hot so the crust won't break.